French newspaper Les Échos reports [Google translation, via SlashGear] that investigators with the country's Competition Authority raided the offices of Apple's French arm last week as part of an investigation into the company's treatment of its resellers. According to the report, the agency is investigating whether Apple offers preferential treatment for its own outlets while disadvantaging independent retailers selling Apple products. The investigation was sparked by complaints from reseller eBizcuss, which had sued Apple in late 2011, charging that product shortages, credit line decreases, and required store upgrades were making it nearly impossible for independent retailers to survive. eBizcuss ceased operations last year. 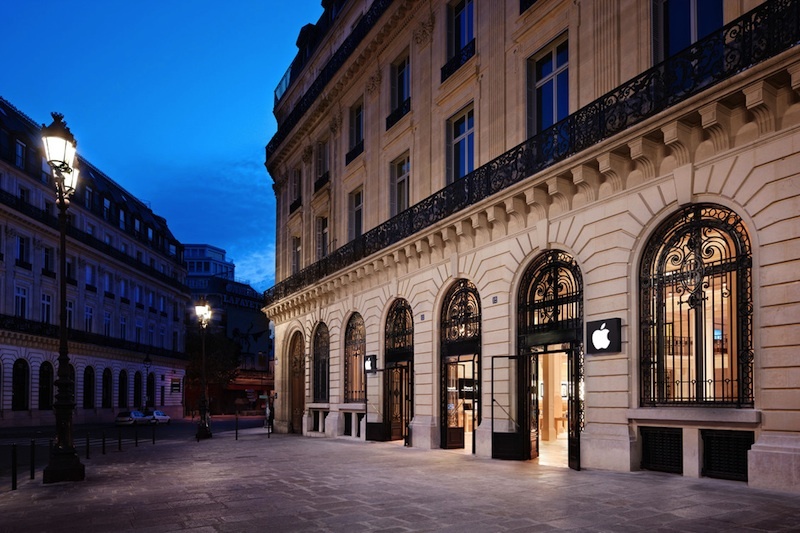 Today's report indicates that investigators searched the offices of Apple France, as well as those of several distributors, seizing documents addressing Apple's relationships with those distributors and ultimately resellers. In addition to the controversy over Apple's treatment of its resellers, French authorities are also examining the behavior of not only Apple but also Amazon and Google for "lock-in" on their application marketplaces that make it difficult for consumers to change platforms. That investigation has apparently been driven by Apple's move to increase the minimum selling prices of newspaper and magazine content, a move that has apparently left some developers feeling trapped between Apple's policies and their customer bases locked into the iOS platform. Why is the government involved here? Because it is France, and the French government has a long history of this anti-business, nationalistic protectionism? I guess I don't understand the full issue here. Apple sells its products. Apple probably ensures its stores have products before everyone else. If you (as a reseller) do not like the terms of reselling, then cease to be a reseller. If enough resellers stop selling and Apple sees a revenue loss, it will change the terms of the resale agreement. It is simple business. Why is the government involved here? There is another side to this: If you don't want to accept the local rules and laws, don't open a business. The government is actually doing its job there: Making sure that everybody plays by the same rules. And those are French rules, not American rules. Stay out of the country if you can't accept that. I feel bad for resellers around the world who filled a real need, and then Apple entered retail--in a huge way. But you can't expect Apple to NOT offer retail when that has been such a vital part of introducing people to what makes their products different and great. You also can't expect Apple to harm their own stores to subsidize other stores. That means when a product is new or facing unpredicted demand, there will be shortages of Apple products. Maybe for quite a long time. It's painful, but it's reality. Meanwhile, my local Apple reseller is thriving, despite a "real" Apple Store 10 minutes away. They serve a very wide range (Windows, non-computer electronics) but they have an extensive Apple store-in-a-store and it's always packed with shoppers. They don't always have the latest new release in stock, but they have found in their niche, offering refurbs, bundles and discounts, tons of accessories, and yes--when supply catches up to demand--the latest products too. It's always hard to survive as a business. The economy now makes it harder. Apple choosing not to empty their own store to fill yours makes it harder. But not impossible. Would that French store really have survived if Apple had given them the product first? Maybe, maybe not. French authorities are also examining the behavior of not only Apple but also Amazon and Google for "lock-in" on their application marketplaces that make it difficult for consumers to change platforms. Lock-in? Wait... what do they think Apple can do with the App Store that will make your iOS app purchases run on a non iOS device? Or one version of Android vs. another, for that matter? Have they never heard of software? Is Apple going to get in trouble because Photoshop for Mac doesn't run on Windows? I definitely see where you're coming from, but there's something I think you're missing. People are always going to want iPhones and Macs. If a reseller doesn't stock them, and there's no Apple Store nearby, they're not going to get those customers. I work for a reseller myself and often you're reselling things you don't want to resell. If there's a request for it, i.e. the 'demand', then they have to get it from somewhere. Sadly it's simply not a case of 'we won't stock it because Apple are breaking our balls', because the problems that arise from that are comprehensive. Yes, if everybody did that, it would probably make a difference. But nobody would be willing to take that risk. And if Apple are making the whole ordeal for resellers a hellish experience, the government has every right to get involved, if they feel an American company are negatively impacting their native businesses. Independent retailers or independent resellers...? I don't get what the issue is. I don't think there should be a problem with treating Apple Retail Stores differently than independent retailers. They're not on Apple's payroll. Or am I missing something...? I agree with the sentiment of keysofanxiety. If you set up a business based around Apple, then decides it wants to change what it does or the ways it wants you to do things you have no choice but to comply. Or go out of business as the example unfortunately appears to have done. It must be a real bugger to train your techs with Apple, at a cost. Open a shop the way Apple wants it and then seemingly put you out of business when it opens a store around the corner/wants an expensive change. France is a socialism nation, and I've heard from many people that the French are generally distrustful of computing technology. I've been there, and everything seems so old (but beautiful). MacMall is great because they repair old Macs, sell slightly old Macs, and sell non-Apple accessories. The Apple Retail Store near me even directed me to MacMall to replace my 2006 iMac's failed hard drive (failed in 2012, which isn't too bad). I opened it myself anyway to save money. ...if they feel an American company are negatively impacting their native businesses. There's the key right there, and the most important element of the equation for France. They are trying to protect their native businesses from the big mean American corporation. I'm usually of the opinion that government should get involved and protect the little guy, but this a bit absurd. I guess I would need to know the exact law Apple is accused of violating, but it sounds odd to me that there is a law that says "manufacturers who also own their own outlets have to treat third party resellers equal to their own outlets" or something like that.